I recently caught up with Gregg and Bryan from Weird Beard Brew Co (<- check out their shiny new website) and other than a chance to have a good natter about what they'd been up to since their meet the brewer at The Rake, they kindly provided some new prototypes brews for me to sample. More on the beers shortly. First of all it was great to hear that they've finally got premises sorted, kit ordered and are days away from finalising their lease as summarised on their blog here. That means they should be brewing before the end of the year which is great news for the thriving London brewing scene. Gregg and Bryan have had something of a frustrating time getting things off the ground, having been let down on two previous premises. Back in April, the target was to be brewing from around about now. Given these set backs, that hasn't been possible but they've both working hard on prototypes brews and one of these (Sadako Imperial Stout) scooped a bronze medal at the UK National Homebrew Competition with the oaked version of the same receiving an honorable mention. A shortage of the 'new world' hops used in some of their original recipes has provided a huge challenge, with some of their intended core range of beers having to be tweaked or replaced with other brews until they can secure the ingredients they desire. The allocation of hops is a source of frustration for many UK craft breweries. With priority being given to established customers, new breweries face a real challenge when working with importers to purchase hops and are often fighting for scraps - a few kilos here or there - or missing out altogether. Consistency will be key to their success of course, so securing a regular supply of the ingredients used in their core range is vital. This brings me nicely to the first prototype beer. This was a re-brew of the Sunshine Saison I'd sampled at The Rake. Reading my notes back then ("a nose dominated by the French Saison yeast with a hint of lemon and peppery spice") and comparing with the beer in my glass provided a bit of a flash back to that very wet April afternoon, and not just because the weather was the same. A good sign on the consistency front. The other two beers were new to me. The first, Holy Hoppin' Hell, is a US style double IPA, weighing in at a hefty 9.3% ABV. The beer poured a deep amber red with an off-white pillowy head. The nose was delicious with oodles of orange, mango, grapefruit being followed by hints of caramel - classic of the style. These aromas were backed up by the taste with some pineapple and bitter grapefruit pith thrown in to the mix. The finish was long and bitter with a nice boozy warmth coming in at the end. 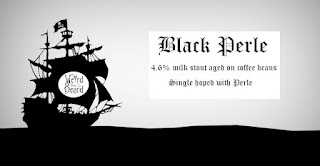 The second is called Black Perle Stout. 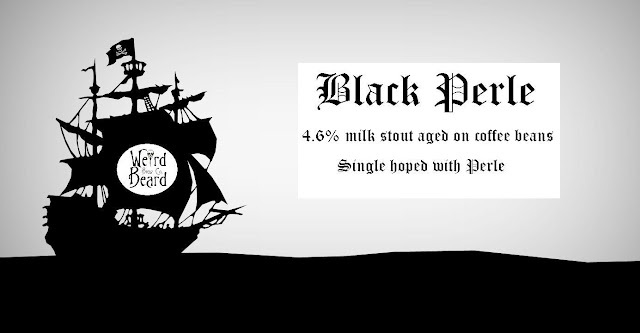 This is a milk stout aged on coffee beans, brewed using only the Perle hop and coming in at 4.5% ABV. This poured jet black with a great looking honeycomb bubble head. The nose was dominated by black coffee. The coffee was the first flavour I got too followed by a pleasant sweetness which provided balance against the bitter finish. This was a solid brew and one that I suspect would really sing when cask conditioned. With the ABV being session friendly, I could see myself downing a few of these. 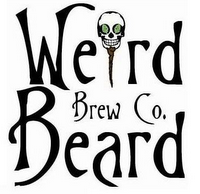 Weird Beard recently brewed their first commercial beer. This was a collaboration with London Brewing, a microbrewery based at the The Bull in Highgate, and another amateur brewer Daniel Vane, who brews under the pseudonym The Dukes Brewery. The guys blogged about their brew day here (<- check out the sparge arm 'modification'). Dan also provided the art work (below) which looks great. 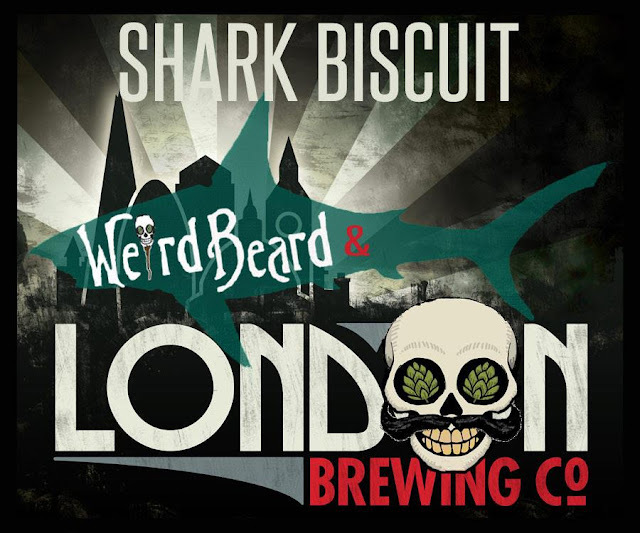 The beer, a 7.4% Aussie-hopped IPA named Shark Biscuit, which rather fittingly is Aussie slang for newbie surfers, launches on Tuesday 9th October at The Bull from 7pm. If you're in town, why not head along. I reckon the beer will pair nicely with The Bull's excellent spicy buffalo wings and intend to test this theory by having my fill of both. All in the interests of entertaining you, dear readers! Good luck to them both, I can't wait to try their beers! Indeed. If the prototypes are anything to go by then we're in for a treat! Cheers for the write up Andy. Sunshine Saison has been renamed Saison 14. If we can scrounge up some Sorachi ace that is. Like the new name. Cheers Gregg.